It's a Mom Thing Reviews & More! : WubbleX - The Zero Gravity Wubble Ball! WubbleX - The Zero Gravity Wubble Ball! Last year my daughter and I were lucky enough to get a chance to review the original Wubble Ball! After seeing it at an event I attended I knew that my daughter would absolutely love it. When we received it we had tons of fun playing outside with it, bouncing it all over the place, sitting on it, playing catch, and more! The Wubble Ball quickly became one of her favorite items. 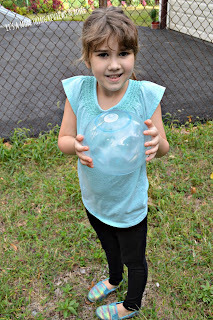 Because of how much my daughter loved the original Wubble Ball I was so exited to get the chance to review the WubbleX, a zero gravity Wubble ball! The WubbleX is a bit different than the original Wubble Ball. While it is made of the same material how you inflate it and how you play with it is completely different! The WubbleX is filled with Helium to make it defy gravity! It was super easy to fill with the included Helium can. All that you have to do it attach the nozzle and fill the ball up! The Helium can is one time use so once it is done filling you know it is time to take the nozzle out and use the patch to cover the hole used to fill the ball with air. After reading the directions it took us less than 5 minutes to fill the WubbleX. It was so simple and my daughter was so excited and ready to play! You can throw the WubbleX, spin it, tap it, and use it for tons of fun games! My daughter, Mia, and my sister were using badminton rackets to bounce the WubbleX back and forth to each other! There are so many things that you can do with WubbleX! We absolutely loved it! My daughter has already been talking about getting one for a friend for their birthday! I know that all kids (and adults too) will love the WubbleX. That is too cute. Madison would surely love playing with something like this. I'm thinking of maybe getting it for her as well now that I've read your review.